If you don't sail, you're probably used to thinking of small sailboats as having a mast in the middle, and two triangular sails, one forward of the mast, the other behind it, making one large triangle, with the mast roughly in the middle. If you look a bit more closely at the standard rig, you'll see that the mast is very tall, and made of aluminum. It is guyed in three dimensions against bending by a fairly complex array of cables and wires, which are spread out to obtain maximum leverage. It is in fact, a complex and delicate hi-tech arrangement.You may well feel it should be serviced by a mechanic. It has not always been like this. There are also things called lug sails. A lug sail differs from what was described above, the Bermuda, by the fact that the sail is (a) rectangular (b) projects forward of the mast. You have a longish upper spar that the sail hangs from. This spar is attached to the mast about one sixth or so of the way along. So when hoisted, a big chunk of the sail is in front of the mast, and the rest, most of it, behind. All the spars are usually short and wooden. There are three different kinds of lug sail: the Dipping Lug, the Standing Lug and the Balance Lug. The lugger Reaper sets both a standing lug and a balanced lug sail. The Dipping Lug, used by Scottish fishermen in the nineteenth century, has no boom. The bottom front corner is attached to the bow of the boat. You can think of it as being the descendant of the old Viking square sails, modified for better ability to sail into the wind. I have never used one, because of the difficulty in changing course, which makes them impractical in confined waters and without a crew. The fishing vessels were amply crewed by strong, experienced people, and had essentially two trips, one out, one back, and could count on consistent prevailing winds, meaning that you did not have to change course that often. Which was just as well, since to change course, you do the following, timing it exactly right. You turn the boat through the wind. You unhook the front corner of the sail from the bow. At the same time you pull down the front of the yard, and move it behind the mast. You take the front corner of the sail behind and across the mast, and refasten it at the bow. You haul the yard back up. The sail is now on the other side of the mast, and you can sail on the new course. Don't try it without plenty of sea room and a good strong crew! However, the great advantage of the Lug for the fishermen, and the reason they would never have considered a modern Bermuda, is its simplicity and robustness. All variants of the Lug have short, free standing masts without the complexity of stays. All are robust, and if anything breaks, repairable with simple tools. The Dipping Lug, without a boom, can be got out of the way to handle the nets, and there's no rigging to get in the way either. The Balance Lug has a boom as well as a yard. The front edge of the sail runs parallel to the mast, and on a 16ft boat with lets say a 12 foot boom, you'll have about 2-3 feet of sail forward of the mast and about 9 feet behind. The yard points up more than with the Dipping Lug, but less than with the Standing Lug, which we come to next. The boom is roped down hard from the 3ft point to either mast or deck, holding everything in place. This means you can sail on either tack without pulling the sail around the mast. The great thing about both the Standing and the Balance Lugs is their safety. The most dangerous manoevre you can perform in a small boat is to gybe. The wind is behind you perhaps at a slight angle, and coming from your left. The sail is flying to the right of the boat. You change course so that the wind is on your right. As you do this, you have to get the sail to the other, the left side. As you change course, the wind catches the sail and will, if not controlled, move it over with extraordinary force. The force is great enough, in anything of a breeze, to break the mast, rip out the rigging, knock crew unconscious if the boom hits them, or capsize you. To avoid this, you warn everyone its coming, you pull in the controlling ropes with great speed, and let them out again very carefully, damping the movement. But not with either lug sail. Because as the sail moves, it pivots about the mast, and the part of the sail that projects forwards generates resistance, and damps the swing. If you are used to gybing with Bermuda sails, when first you gybe with a lug, you'll wonder what happened. It seems so tame. It is. There is another interesting thing about all three lug sails, and that's their efficiency. There is no doubt that the Bermuda rig is the best performing sail on the basis of area. That is, if you restrict yourself to a given number of square feet of sail on a boat, you'll get a faster boat if those square feet are set as a triangular sail. The lug by contrast is very efficient in a way that no-one now cares about. It is the best way for a given hull to safely carry the maximum sail area and get the greatest driving power. This is because it has a very low centre of resistance, and so it has less heeling effect on the hull. The Balance Lug has never been a working sail. It was used at the turn of the last century in the UK for pleasure boats. Its disadvantage is that it has one good tack, when its on the far side of the mast, and the wind fills it well, and one less good one, when the wind blows it against the mast. The Standing Lug was the working alternative to the Dipping Lug, for smaller boats, and its my own preference in small boat sails. The Standing Lug also mostly has a boom. 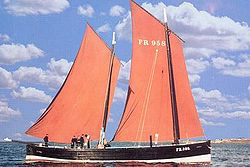 The yard points more vertically than with the Balance Lug, and the sail is hoisted by an attachment about the usual one sixth of the way from the end. The real difference is the front corner of the sail is roped down hard by the end of the boom to the mast or deck. At deck level, the boom doesn't come forward of the mast at all, so the sail shape forward of the mast is a triangle, not a rectangle, and its in the upper part of the sail, not all the way down the mast. The Standing Lug gybes a bit more aggressively than a Balance Lug, but not impossibly so. It sets rather better on the bad tack. It drives better than almost any other sail you can put on a boat, if your criterion is how the boat does with the optimal area for it, as opposed to how the boat does with a restricted sail area. The spars are short and light. On a 16ft boat, you can carry mast, yard, boom and rolled up sail over your shoulder for a half mile without effort. You can drop them in the back of a station wagon. You have one cheap pulley embedded in the short wooden mast, one block on the sheet rope, and that's it. Your rigging probably cost all of $50. If your mast breaks or rots, you can make another in a weekend from lumber yard timber. You can step the mast with one hand, hoist the sail and get your boat on the water while the Bermuda guys are still figuring out where all the ropes go. A half hour later, the Bermuda guys will pass you. They will be hanging out over the rail, wearing Lycra. They will wave. They will be a little surprised however, when you pull in the sheet. Because although they are faster, they are not that much faster. Surely they should be a whole lot faster than this funny antique looking rig? Extracts from In Praise of the Standing Lug with the permission of the author Protagoras.